Summer parties scream being outdoors but the English weather might not always be in agreement. However, with careful planning, even in a downpour it’s possible to host a successful al fresco event. Nothing says summer like a festival, whether it’s Glastonbury in the UK or Coachella in the US, so why not create your own festival for a quintessential summer experience. Think tipis dotting across a sprawling lawn to provide shelter from the elements with a variety of Great British food tents. A great line up of musical acts and quirky entertainment will help your event achieve that summer vibe. With such a wide variety of stylish street food and food stall available it’s so easy to create informal dining options with a different cuisine styles. If you’re worried about the weather we recommend setting up a number of tipi tents and then choosing food based on the Great British Menu; strawberries & cream with giant meringues, afternoon tea, local cider, cheese & biscuits, curries, fish & chips van, rotisserie chicken van, Pimms tricycles, alcoholic pops …. the possibilities are endless. Set up a main bar inside a styled marquee to refresh guests but also think about having smaller hydration stations, including buckets with drinks on ice spread throughout the grounds of your venue. Consider using a colour palette to tie everything together – we suggest using either a soft pastel ‘vintage’ style look or a more vibrant punchy ‘party’ style. 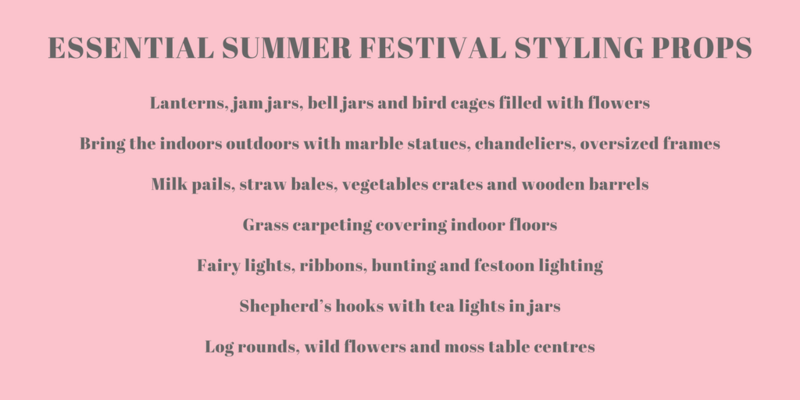 Outdoor seating areas, picnic benches and wooden tables can be decorated with wild flowers in Wellington boots and jam jars to create a relaxed feel. Don’t forget a selection of parasols for shade and throws for benches. To further enhance the theme try wooden stumps and open fire pits for the seating areas and giant lawn games. Each food tipi could be decorated with props and festoon lighting to connect them and suspended inside from the roofs. Later in the evening, as it begins to get dark, uplighting can be used to illuminate the venue with large ground torches lit. Gas heaters will provide some welcome warmth to the evening party. Choose entertainment acts that can move freely through the crowd such as glitter artists, acrobats and walkabout forest creatures. We love acts like ‘Wandering Hands’ who are able to mingle with guests and interact with their acoustic instruments. Stand-out features such alcoholic fountains and vintage sweet shops will get guests mingling whilst traditional games such as tin-can alley and a coconut shy are great for bringing people together. The culmination of the festival should be live bands performing in the main area with night candles lit, glow in the dark festival fashion provided to guests and fireworks to light up the sky. At Evolve we regularly share news about latest venues, styles and events on our blog and social media. You can visit our blog here and follow us at @evolveevents. For more ideas of styling tips for events see our Pinterest boards here.